We’ve just come out of a great season of activity with teams here on the Yucatán peninsula throughout the month of March. 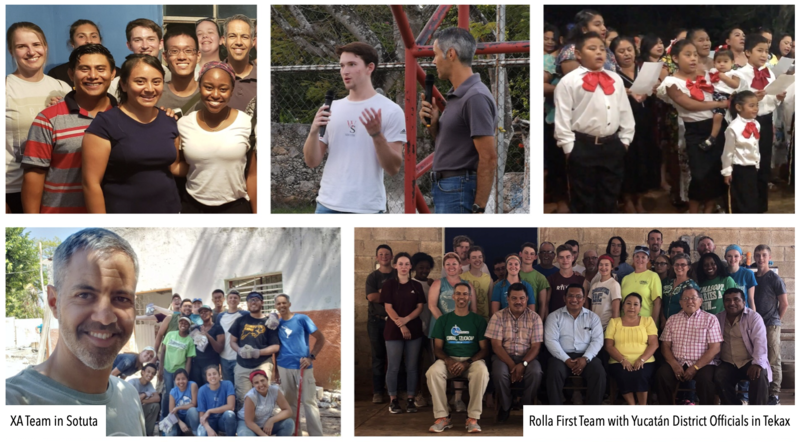 In the first week, we were blessed by Chi Alpha (XA) groups from Richmond, Virginia, and Washington, DC as they renovated Monte Horeb, a church revitalization project in Sotuta, Yucatán. Afterward, we headed south to the town of Tekax to continue the construction of the new church, Senda de Vida, accompanied by members of Rolla First Assembly and fellow missionaries, Nicky Rider and Loyd Cogdill. The physical impact of their trip was apparent, as the XA team raised a new roof over the church building in Sotuta, and in Tekax, block walls rose from the ground, forming a new sanctuary through the efforts of the team from Rolla First. But, there was more to these trips than the construction itself. There was a work of restoration. In Tekax, not only were former members encouraged to rededicate their lives to the Lord through the visit of the Rolla team, but also one of the ladies in the church testified of physical healing after several team members had prayed for her! There was also a work of unification. The teams came together despite the difference in language and culture, despite the heat and the pressure of the jobs they faced. As Sam, one of the XA team members said, they left their comfort zone to give of themselves. Whether that was in the sharing of a testimony, in Sam’s case (photo top middle), or singing “10,000 Reasons” in English during the welcome service, in the case of the Spanish speaking church members in Tekax (photo top right), each group made an effort to come nearer, to bridge the gaps, to know and be known as the body of Christ. The result was truly something beautiful, and the impact, for both team members and nationals alike, profound. 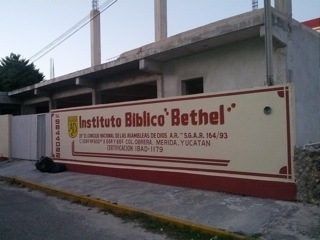 As we close this update, we express our gratitude, not only to the teams and the churches that received them, but also to you, our supporters, who make it possible for us to facilitate these connections, working to fulfill the vision of the Yucatán full of churches. For our updated prayer list and links to our secure giving site, head over to our support page. The groundhog might have declared six more weeks of winter, but our spring newsletter is here early! Take a look at some of what’s been going on in this last ministry quarter. And a bit about what’s going on with our family. 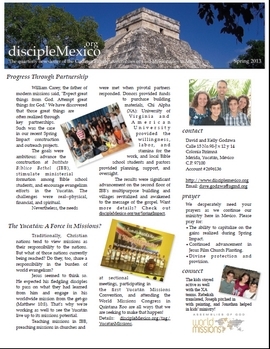 The Spring Newsletter is Now Online! 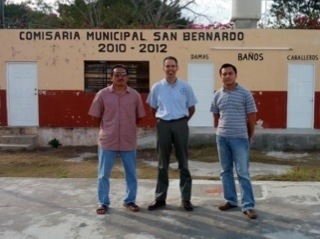 When it comes to accomplishing our goals on the mission field, we realize more and more that partnerships are crucial. 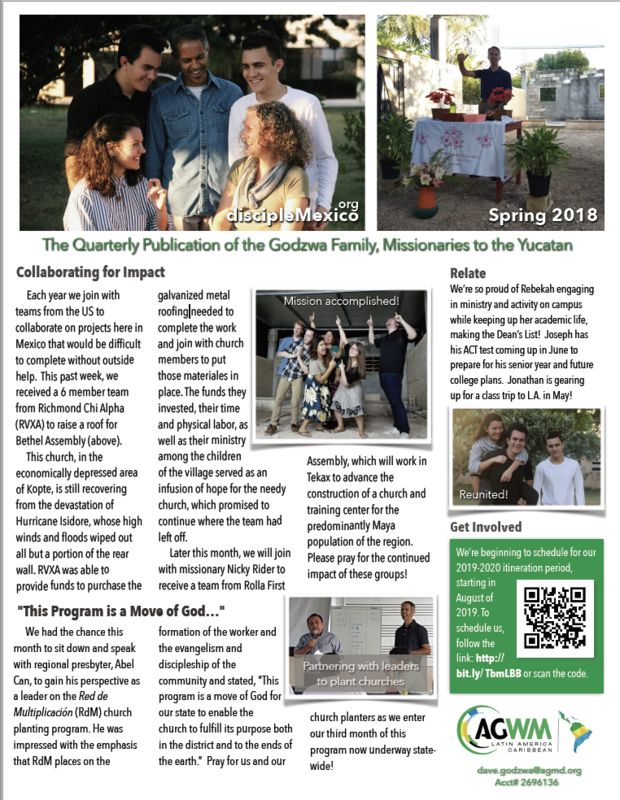 Hit the link here or click on the picture to find out how those partnerships came into play during our Spring Impact construction and outreach project! While you’re there, don’t miss the rest of our latest quarterly update from the field, and be sure to follow the links for more content! We’re headed back to Muna with the AU Chi Alpha Team for a week of ministry. For the first two days, Kelly and the kids will join me as we minister in the Sunday School and Sunday night services, sharing crafts and teaching with the kids and stewardship training for the adults. On Monday through Thursday, the family will be returning to Mérida while the team and I will continue to involve ourselves in construction, general labor, outreach, and evening services. Pray for us as we seek to make an impact. While I have you, I’d like to mention a the changes we’ve made to our Contact Us page. We’ve updated our VOIP phone. The new number is 814-746-4952. You can call us via your US based land line or cell for the cost of a US long distance charge. (If you happen to be located in Erie, PA, it’s a local call.) Also, check out the other options to communicate to us through email, IM or Skype! So visit the page, and drop us a line, however you choose to contact us. We’ve got our ears on! We are preparing for a busy week of ministry as we receive my brother, Mike, and his team of 9 students from the Chi Alpha Campus Ministry at American University. Instead of choosing a party spot, this group has decided to invest their Spring Break in ministry, trading a beach towel for a shovel and all night partying for evangelistic rallies. The group arrives at the Mérida airport tomorrow at 9:00 PM, but that’s not where the story begins. This event has been in the planning stages since November of last year, and it’s scope is larger than anything we’ve attempted before. 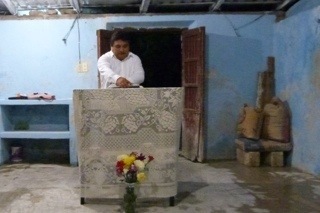 Preparations began with two intensive evangelism training courses held in Muna and in Mérida. In these sessions, 4 churches had the opportunity to learn about personally communicating the gospel. We encouraged each student to focus on a list of five individuals that they could evangelize, praying, serving and sharing with each person in the months that preceded the arrival of the Chi Alpha team. The team in turn was preparing to share a gospel message, with the hope to be able to share this message with people who are ready to receive. At this point, the excitement is brewing with several churches looking to capitalize on the special event that is the ministry of these college students. 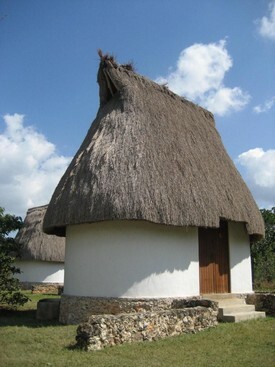 In Abalá, a village 1/2 hour away from Muna, there are plans to plant a church, in Opichén a town on the route to the Maya ruins of Uxmal, the town square is being reserved for the event. In Muna, the evangelism committee has painted 20 walls with the phrase: “Do you feel dry?” (Te sientes Seco? )The answer will be brought as the team distributes water and an invitation to the night’s service that says “Jesus is the water of life!” In Sacalúm the church has planned a 3 night campaign that the team will open on Wednesday. Thinking about all of this, I can’t help but smile. Our desire when we arrived in Mexico was to serve as a catalyst within the state of Yucatán–an element that would enable the local church launch out in ministry. As this event begins to take shape, I have the feeling that we are accomplishing that goal though these efforts, providing opportunities for congregations to take their place as Christ’s ambassadors as they announce the kingdom of God in their communities. Keep us in prayer this week, and keep posted for the good reports as Americans and Mexicans work side by side in ministry. By the way, for those of you that voted on last week’s post we’ve declared Mike the winner! His prize? Well a trip to Mexico. of course!